120 Days and it is over, just like that. 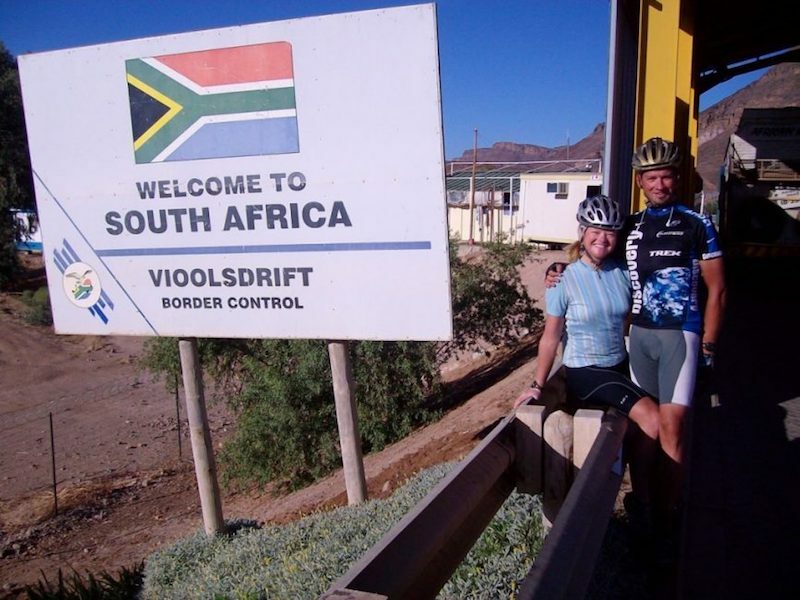 We cycled the continent of Africa! How do you sum up the most challenging experience of your life on one short blog? Well, let’s try…. 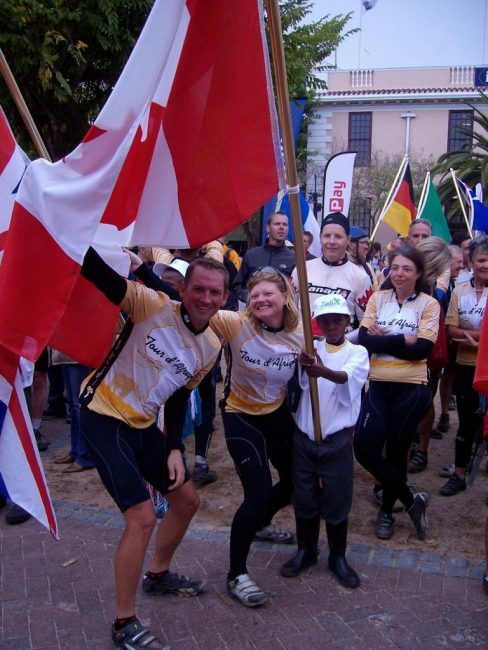 We arrived in Cape Town to a large cheering crowd on Saturday May 10th and it was completely overwhelming. We didn’t expect such a welcome party. A pavilion was set up at the waterfront filled with friends, family, fans, curious shoppers and people in the surrounding cafés taking notice. Our country flags were on display held by local children and a vibrant band played us in. The fanfare was second to none! As race leader, I led the group in with the men's leader. Immediately after crossing the finish line, I was interviewed by South African Television and actually had tears in my eyes when they asked me how I feel. Luckily, I kept it together and Vicki would be proud to know that I mentioned Plan and Our Website-all that media training paid off! CBC Radio interviewed both Dave and I. Photographers snapped our picture and we schmoozed with our Canadian Ambassador Chris Brown. It was quite an amazing experience. After a short reception where we drank coffee to warm our chilled bodies after a 110 km ride in the mist and wind. Not much time to waste though, we were quickly off to the Amphitheatre for the awards presentation. Dave received his EFI Medal and I received my award for Race Winner. It wasn’t until the dinner and a more formal reception that evening that I received my incredible trophy. A beautiful traditional mask mounted with a 1st place plaque and some lovely paintings by a local artist for my Section Wins. It was an awesome evening with great food and company. After all of the formalities, we ripped it up on the dance floor until all hours of the evening and paid for it the next day lounging in our hotel room watching movies. 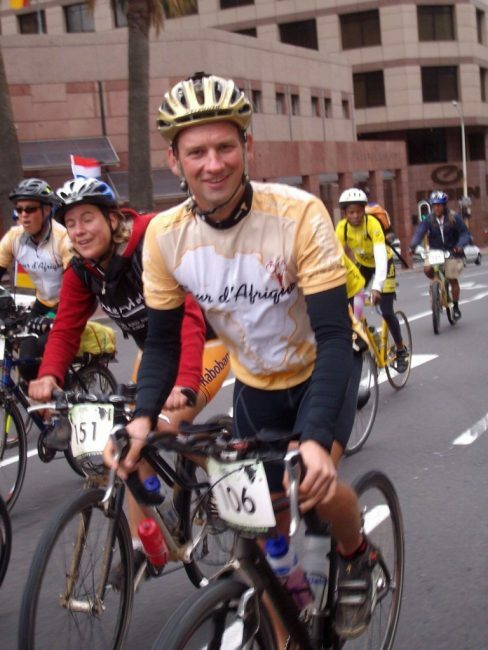 I have to say that we are so happy that we did the Tour d’Afrique. Yes I complained a lot. I Laughed, I cried, I kicked and screamed, but like anytime one pushes themselves to their limit, it is never easy while living it, but always special once it is over. To think about what we accomplished, it is quite unbelievable. Dave rode every single day through illness, a sprained ankle that he kept re-twisting during the first month, exhaustion and of course saddle sores. I survived a serious infection and managed to come back when I was sure that my riding days were over. I could never have finished this race without Dave. So many times I wanted to go home, throw in the towel and call it a day. But Dave kept me strong and because of him, I achieved my goal. As a couple this was an amazing achievement. Yes we fought, we laughed about fighting and we bonded more than ever. It strengthened our relationship and we have never been so proud of each other. We were so lucky to have one another to share our fears and frustrations of the day as well as our triumphs and victories without worry of how they will perceive you. Dave and I can tell each other anything. I am going off course now, Dave is making a coffee and I need to brag. I am so proud of his performance in the TDA. He made it look easy and pulled me through each day. I received most of the attention at the receptions, but if everyone should know how strong he is. He came into this as a non-racer and recreational rider. By the end, he was racing in the peloton, doing a great showing in time trials, losing almost 40 pounds and reshaping the muscles on his legs. Incredible! The night before we rode into Cape Town, they gave away fun awards. As most of you who know me, I naturally won the biggest Drama Queen;) I felt that Dave should have won most improved rider and most weight loss, but they didn’t put those categories in. Oh well, I will give him a special award. 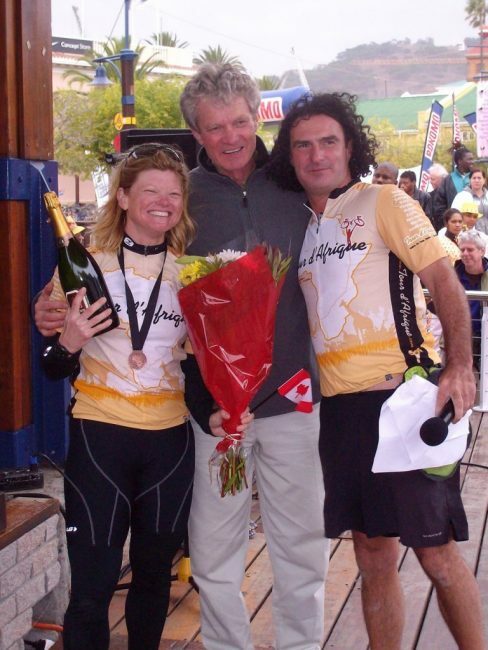 After completing the Tour d’Afrique, I feel like I can accomplish anything. I know that it sounds cliché, but this really was the most difficult thing I have ever done in my life. Waking up at 5:00 in the morning, rain or shine, hot or cold. Sleeping through blowing sandstorms and heavy downpours, Huddling through freezing nights to boiling in hot humid weather. We really went through every condition and survived every element and it only made us stronger. So many days I felt like it was too much, but once I arrived in camp all was forgotten. Now that we have finished, the sense of accomplishment is unbelievable. A year ago, we were happy to ride 20km after work. Now Dave can ride 100km in less than 3 hours and I am not too far behind. A 207km is pretty achievable if not downright easy except for the monotony of riding for so long. And reaching over 70km going downhill is a lot of fun. I used to brake when I reached 30km at home now I am riding as hard and fast as I can to make better time. I have often read of people saying that after achieving an extraordinary physical challenge, they feel that they can now do anything. I never understood what they were talking about until now. This was hard, every day; it was hard. And every day, we got up and finished, so to get up and do anything in our lives in the future, should be quite easy by comparison. One thing I must say is that if anyone is wanting to do the TDA you must be prepared for the most gruelling and truest test of not only your physical strength but mental as well. We learned, as everyone else did, that there really is no way to train for this. Even people who tried to put in the kms before they came soon found out that it was no prep for the days ahead. As we pack our bikes back into their boxes and take stock of what things we have left over, it is hard not to look back on certain experiences of the last 4 months. The people we have spent so much time within our mobile village are now starting to head home to resume their lives and hopefully take something away from this as we have. There are people who we will keep in touch with and ones we won't. But when we talk about this adventure their faces will be forever associated with the stories we tell. 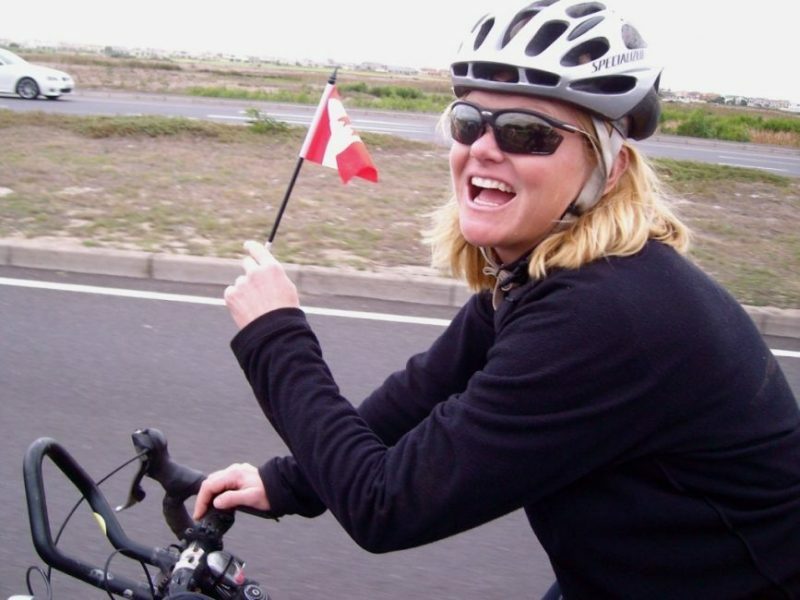 Some say we are crazy, some say we are not but, if we are crazy, we are safe in knowing that we are not the only ones as there are 60 other crazies that thought subjecting yourself to travelling Africa by bicycle would be a fun thing to do. One thing that we will be posting next is the lists of What we should have brought, what we should have left behind etc. So it will give any of you future TDA participants an idea of what is needed to run your life smoothly for 4 months out of a red box. 19 Responses to "We Cycled the Continent of Africa"
Congratulations you guys. It’s a very moving and inspiring post to read. By any chance did you also write anything on how you trained yourself for this? I believe we did. But the posts are quite old and limited. We trained for a year. In January 2007, we started doing spin classes 3 times a week. We kept that up until we could ride outside and then we trained three times a week. We did two shorter rides duirng the week, and then on weekends, we did anywhere from 60-100 km. Nothing prepared us for how difficult it was. The first day in Egypt we rode 160k with headwinds and just about didn’t make it into camp. The first month was really tough, just trying to get into camp each night before sunset. Each day in Egypt was always around 100k a day and our first 6 six days were 100-160 days. We were in rough shape. But soon, we got better and by month 2 we were feeling good. Amazing Amazing Amazing. What an incredible journey. Un-Freakin-Believable! Con-Gratu-Freakin-Lations! You 2 truly are incredible. I’m proud to call you my pals. Way to rock that first place! So proud of you. Ok we are ready for your next venture so we can have fun tracking your progress. I told you my kids loved hearing the details and ask about you daily. You are so inspiring Deb and Dave. Hope to see you next time I am in T.O. What you’ve accomplished is simply amazing. Deb, I’ve known you for over 20 years, and I’ve never met anyone else who showed so much determination. Is there nothing you can’t do? Congratulations! !You are amazing!!! !I knew this was going to be a huge undertaking but I had no idea it was of this magnitude.I have loved every minute of the journey ,your blogs ,the beautiful photography,and the drama of it all. PS Deb,I always knew you could do anything you set your mind to!! Congratulations to you both! There was never a single second that I thought you would ACTUALLY pack it all in and leave…. even though there were immense frustrations! I think you underestimate yourself Deb. It sounds like it was such an intense experience for you and Dave as a couple, and for each of you as individuals. Even though it was tough, you only grow stronger and you can always appreciate things and experiences, however difficult, much more when you are removed from them. The beauty is that this experience will always be with you and be the encouragement you need to do whatever it is you want to do in life. Mike and I are so happy for you and we are absolutely busting to hear about it all! We can’t wait to see you when you get back! Congrats guys……you rocked it like we knew you would! CONGRATULATIONS Deb and Dave!!! I am SOOO proud of your accomplishments and have been following your blog throughout! I was teary eyed reading your blog as well! Deb and Dave, Congrats from Danny and I. This blog has brought tears to our eyes. You’ve really captured the sensation you have right now beautifully. I am so happy for you to have made it to the finish line- and with accolades. Dave and Deb, you’re awesome!!! OMG! YES! YOU DID IT! I’ve been texting you since Friday, but assumed you were either not receiving them, or were busy. Like I’ve said so many times before, I can’t wait until you’re home safe, sitting by the fire at the trailer, drinking our homemade Cranberry Cianti, and hearing your many stories. So proud to be your friends. Way to go!!! Congratulations on your superb finish! You went through so much and I’m thoroughly impressed with your dedication to achieve your goal. I have enjoyed reading your posts and would love to hear more advice you have for future riders. If you are having any sort of presentation when you are back, I would like to attend.